I opened up my mailbox a few days ago and was happy to see one of my envelopes in there from a TTM. I haven't gotten nearly as many as I had earlier in the year. This, however, has been by design. I have learned that TTMs are a great winter hobby that can keep me busy while waiting for the season to start. I have sent out a few this past week, just to get a few things off of my desk. 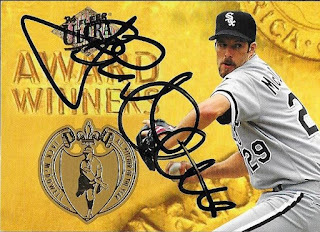 This return from Jack McDowell has reignited my interest in TTMs, though, because the cards I got back all turned out great. 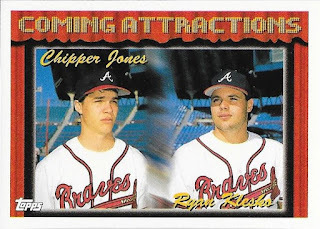 The top card from 1994 Fleer Ultra looks great, as does the above 1988 Topps Traded. The below 1993 Flair is from one of my favorite brands to get signed. 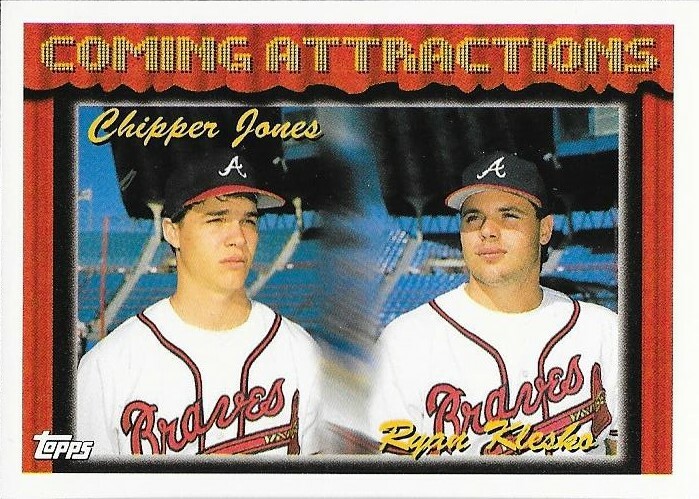 Also, I really like the mid-to-late 1990s Fleer because of the matte finish. Autos really show up nicely on those as well. McDowell (b. 1966) played in the majors from 1987, 1988 and 1990 to 1999 for the White Sox, Yankees, Indians and Angels. He had a career record of 127-87 with an ERA of 3.85 and 1,311 strike outs. 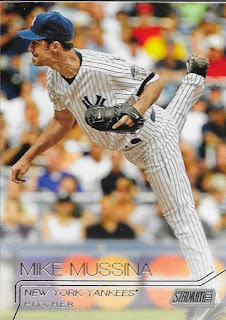 His best season was 1993 when he went 22-10 with a 3.37 ERA on his way to the Cy Young Award that season. He also won 20 games in 1992 *and finished second in the Cy Young voting). 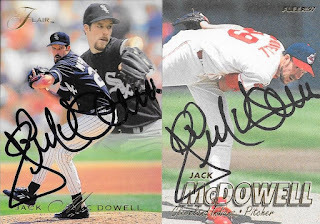 McDowell was also a three-time All Star. He appeared on the 2005 Hall of Fame ballot and received 0.8% of the vote. 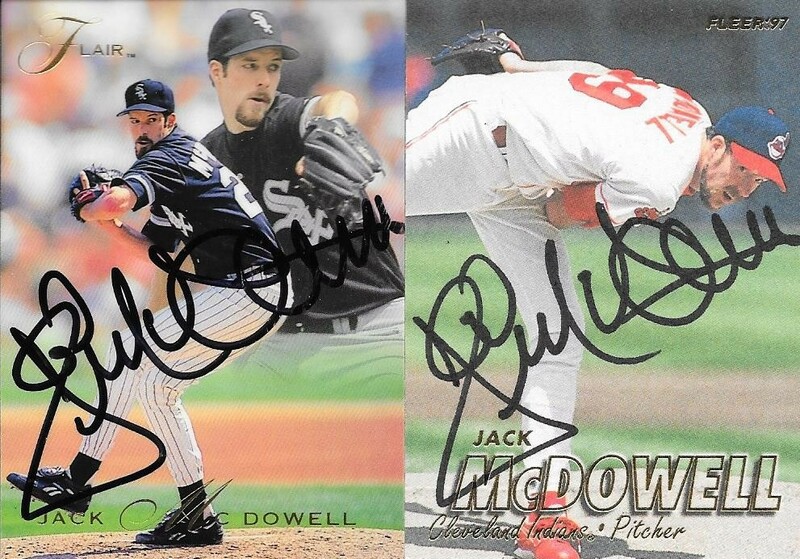 I mailed the four cards to McDowell on March 4 and got the cards back on September 24 for a 204-day TAT. Because of the amount of money that I spent at the National, I told my wife that she really didn't have to get me much of anything for my birthday. On top of that, I really didn't want her to re-gift a bag of socks that I had bought myself and forgot about (long story) either, so I bought myself one thing that I had seen advertised on Topps.com. When it arrived from Topps a week before my birthday, I had my wife wrap it up to give to me on my day. This Rocky 40th Anniversary card set was being offered by Topps at a pretty decent price, so I picked it up. I didn't pull one of the randomly inserted Sylvester Stallone autograph cards, but overall, I was really happy with the set. 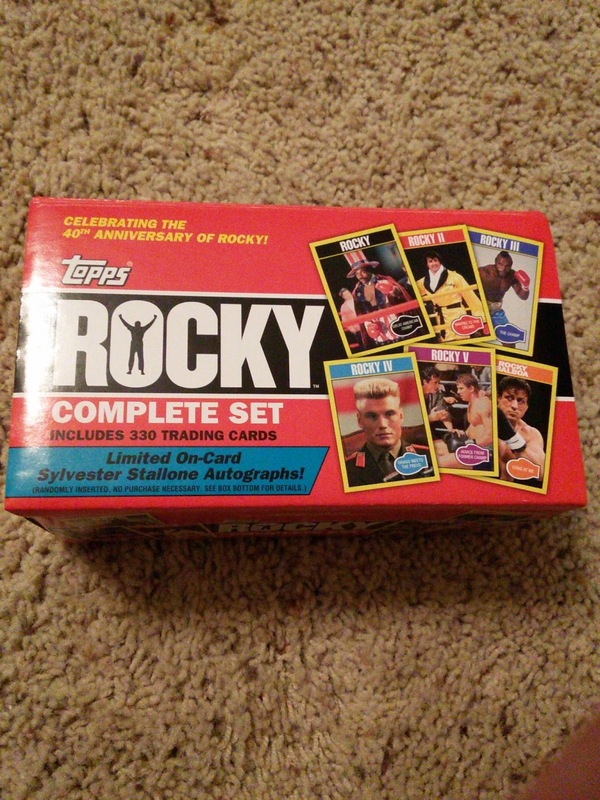 The set features scenes from each Rocky movie from the original to Rocky Balboa. They did not include anything from Creed. That's ok, though, because they had plenty of Apollo to go around!! 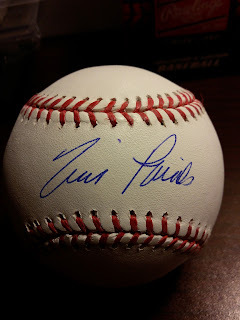 The other paid signer that Andrew and I had vouchers for was Tim Raines. 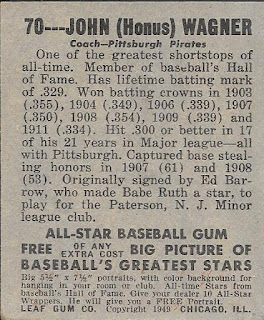 His vouchers were pretty cheap, and I figure that he will eventually get into the Hall of Fame. He was a very nice guy as we got up to him. His line moved so fast, probably because Andrew and I had vouchers 1 and 2. I told Raines that I hope to hear his name called in January for the Hall. He said "Yeah, I've been hearing that a lot lately." Raines (b. 1959) played in the majors from 1979 to 1999, 2001 and 2002 for the Expos, White Sox, Yankees, A's, Orioles and Marlins. He had 2,605 hits, 170 home runs and a .294 batting average. His 808 stolen bases rank 5th all-time. He won the 1986 NL Batting Title with a .334 average. He was a 7-time All Star and finished as high as 5th in the NL MVP voting (1983). He won the World Series in 1996 with the Yankees. Raines has appeared on the Hall of Fame ballot 9 times and with the new eligibility rules, next year will be his last. He has gotten as much as 69.8% of the vote and should be able to get the required 75% next year. If not, he will most likely get in via the Veterans Committee. Even though his bat is ice cold, and he was ejected today for the first time in his Orioles tenure, I wanted to show a nice Chris Davis card that a guy sent to me out of the kindness of his heart. A guy with the handle @linklatercards messaged me a while back and asked if I had this Davis pink parallel. I did not, and asked him his price. He said no price, he just wanted it to go to someone who would want it. I did, and he sent it on its way. He didn't have to do that for me, but he did. This is why I continue to love the card community, and the Instagram community. I love the card and it is a welcome addition to the Davis PC. 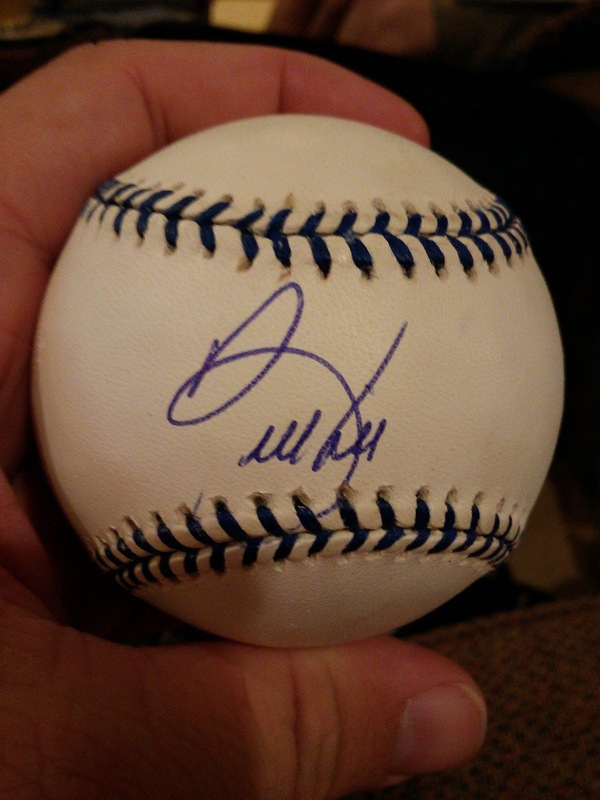 There was only one free signer at the National that I had interest in getting on a ball. 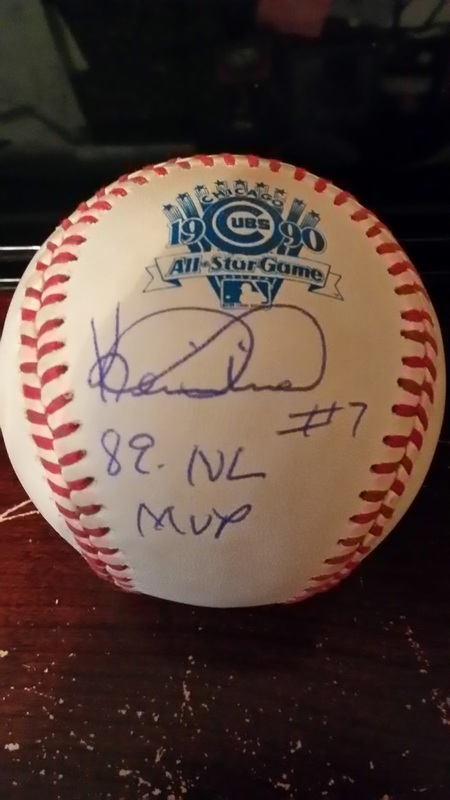 I found this 1990 official All Star ball for a good price on Ebay and figured I would get Kevin Mitchell to sign it. His line was pretty long, like all of the others, but this one was worth it. 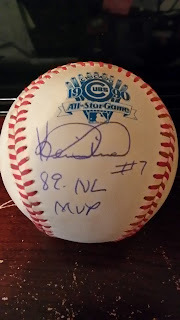 Mitchell inscribed his uniform number and 89 NL MVP on the ball. He was surprised that I wanted it on the side panel below the All Star logo, asking me a couple times "don't you want it on the Sweet Spot?" I wanted the logo to show with the auto, and it looks good, I think. Mitchell (b. 1962) played in the majors from 1984, 1986 to 1994 and 1996 to 1998 for the Mets, Padres, Giants, Mariners, Reds, Red Sox, Indians and A's. He had 1,173 hits, 234 home runs and a .284 career average. He was an All Star in 1989 and 1990. 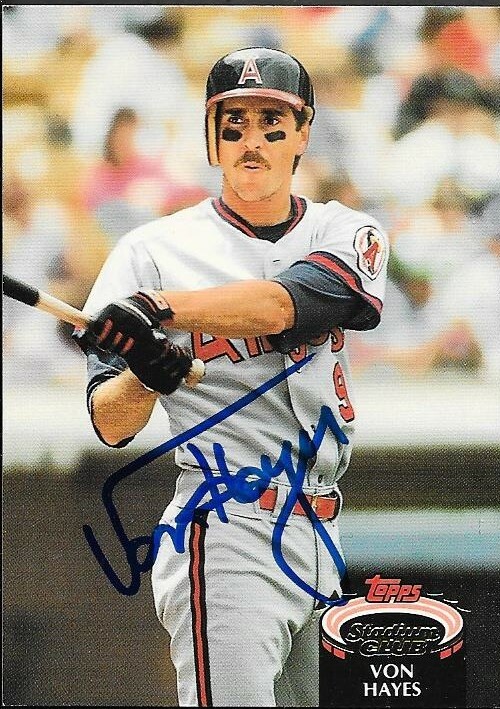 In his 1989 MVP season, he his 47 homers with 125 RBIs and a .291 batting average. 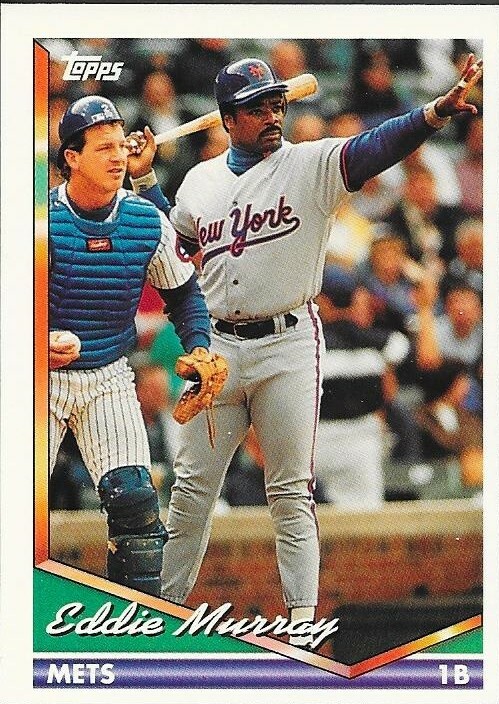 Mitchell won the World Series with the Mets in 1986. He appeared on the 2004 Hall of Fame ballot and received 0.4% of the vote. 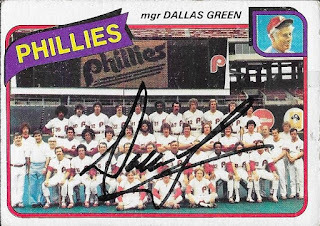 I received a TTM success on September 9 from former player and manager, Dallas Green. THe cards had been out for a long time, and I finally got them back. This 1963 Topps was a pretty cool card to get back, even though it was a bit beat up. I didn't have many of them to get signed, so adding this to the Topps Autograph Project was a plus. I only had one other signed 1963 Topps. Here is a nice signed team card from 1980 Topps. Getting these signed by managers is pretty cool, I think. Green (b. 1934) played in the majors from 1960 to 1967 for the Phillies, Senators and Mets. He had a career record of 20-22 with an ERA of 4.26 and 268 strike outs. Green would go on to manage the Phillies from 1979 to 1981, the Yankees in 1989 and the Mets from 1993 to 1996. His career record as a manager is 169-130 with one World Series Championship (Philles - 1980). I mailed to Green on March 12 and got the cards back on September 9, for a 181-day TAT. I knocked 8 more 1969 Topps cards off of my wishlist during my recent buying spree on Sportlots. I have slowed down on this set, only because I have been busy working on other things in my collection. I want to finish this set up sometime soon, but haven't been too motivated. I only grabbed a couple 1969s while at the National. Once I get these eight cards posted, my wishlist will be up to date. This is the biggest reason why I went ahead and posted them today. 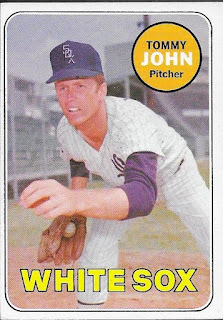 Tommy John was the biggest name in the group of cards that I got. The rest were just random guys that I needed. I'm hoping to get back to some National posts soon. I still have so much from there that I have yet to show. I hope it hasn't been too much! 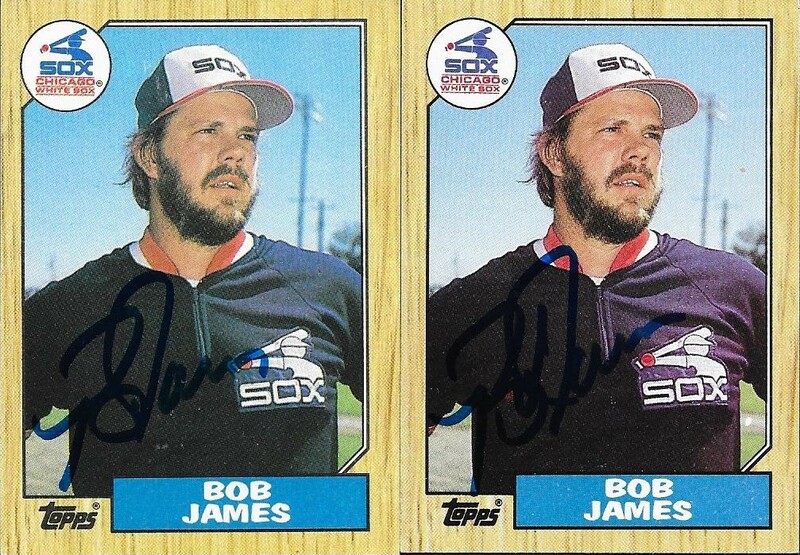 I received a TTM success from former pitcher Bob James way back on August 23. I have had so much to post recently that I kind of buried these cards in my "to be blogged" pile. 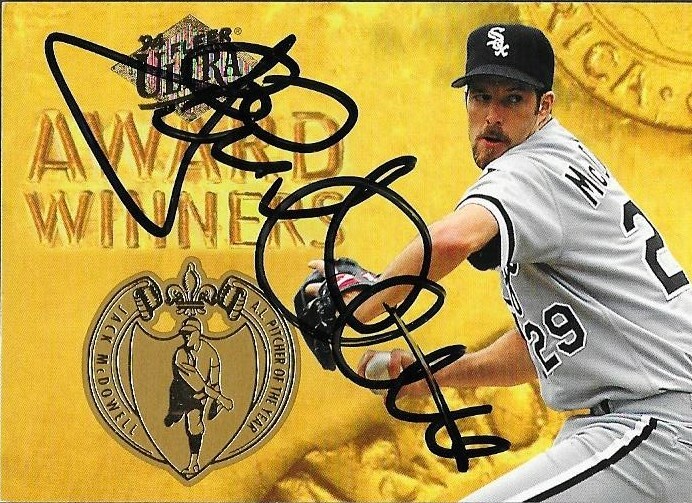 I actually have another TTM success that came in later that I still need to post as well. I also plan on sending out some TTMs soon, but will likely wait until the regular season is over. James (b. 1958) played in the majors from 1978-79 and 1982 to 1987 for the Expos, Tigers and White Sox. He had a career record of 24-26 with a 3.80 ERA and 340 strike outs. I mailed to James on February 22 and got the cards back on August 23 for a 213-day TAT. I actually sent three cards, but he only signed these two and returned the other unsigned. 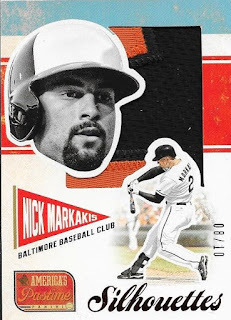 I added a few more 2015 Stadium Club to my set recently with a Sportlots pickup and a nice care package from blog reader, Mark M.
Mark knocked four of the cards off of the list while I added ten from Sportlots. I have been on Sportlots for probably 10 years (or very close to it) and have enjoyed using it as a tool to help complete sets. I picked up the Stadium Club cards last week when I was working to complete the 1994 Topps set. I also appreciate Mark helping me with this set. He also was very nice to help with the 1994 set. 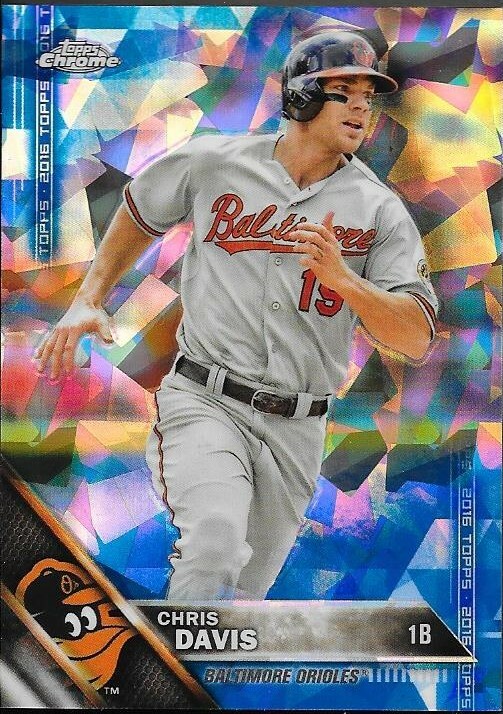 I picked up this nice 2016 Topps Chrome Chris Davis sapphire parallel recently for a great price on Ebay. The first one I saw was going to $18 or so, but this one was $4.95 shipped. I'm glad I waited (not usually my strong point). 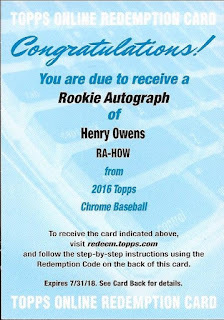 This card came from the 2016 Topps Chrome Sapphire set, of which 250 were made. Not bad, but these aren't numbered. The card still looks good! I received an amazing birthday gift from my very good friend, Max, recently that included some really awesome stuff. He had already shown me the above Eddie Murray - Chris Davis jumbo relic booklet card since he knew it wouldn't arrive in time for my actual birthday. Still, the card is amazing, and I am really happy to get it in the collection. The booklet card is numbered 4/5 and had actually been something I had been watching on Ebay for a while. When the card fell off of Ebay, I figured I missed out, but luckily, my good buddy had picked it up. 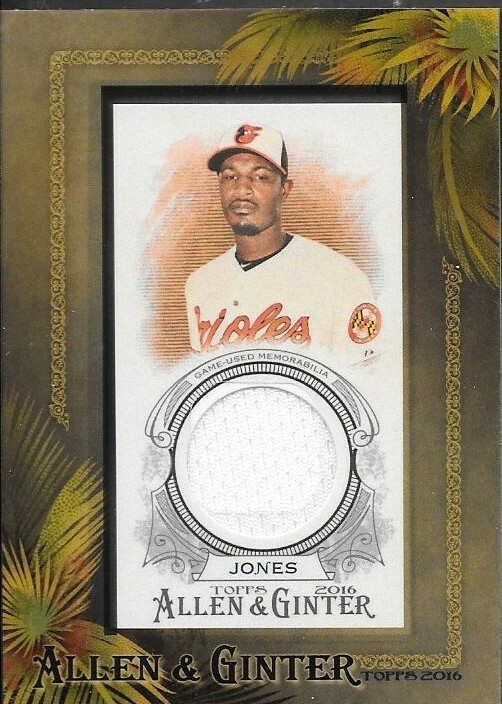 This card came from 2015 Museum Collection and will look great among the rest of my Davis booklets. Max also sent along some cards that he had gotten autographed recently, as well. I sent him every Bill Ripken base card that I had since Max informed me that he had a chance of meeting him at Wrigley Field. Max got a few cards signed for himself and sent these, along with his unused card, back to me. 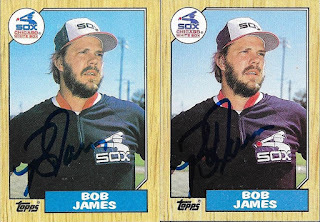 I am really excited about adding these to my IP/TTM binder. Max has been a huge contributor to this binder, and he has been the biggest inspiration for me to add to it. 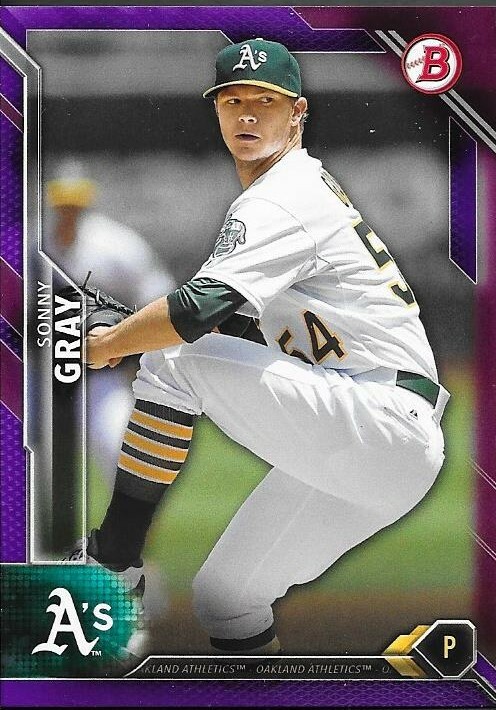 Finally, Max had pulled this 2016 Bowman purple Sonny Gray and offered it to me in trade. I send him tons of Cubs stuff, so I know I will have something that will match up with it very quickly. This card is numbered 49/250. I first traded with Max a couple years ago via Instagram and really hit it off with him. An easy-going personality, a great sense of humor and a selflessness beyond his years has completely endeared him to me. He went out of his way last year to invite us into his home and host us for the 2015 National. He is a constant force in helping guide my collection these days. He makes time to skype with me and go through 5,000-count boxes and pull the best base cards for graphing. I don't believe I would have jumped headfirst into getting random base cards signed. 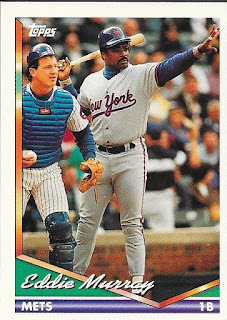 This has led to my new appreciation for 80s-era junk wax cards. 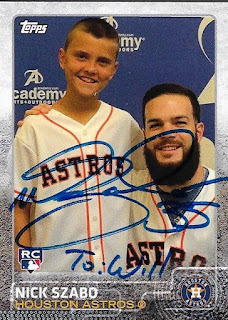 It has been a lot of fun seeing some of those cards come back with signatures. Max has been an awesome friend, and I can't thank him enough for all of the help that he has given me over the years. His letter that was included with the package assured me that he felt the same way on his end. Thank you so much for the package, Max. I appreciate it beyond words. My last mailer from Sportlots came in today, from an order I put in last week. I was filing away cards that I had gotten from two different packages and realized that I was missing one more card than I had on my wishlist (the above card number 777). I also learned that card number 379 did not exist (and that there were two card 370s). So, I picked up the remainder of what I needed and can finally mark this set off of my list. I now need to sort what I have of 1995 Topps so I can get moving on that set. Once it is complete, I will have an entire run of Topps sets from 1973 to 2016. Add in 1951 Red Back, 1955, 1959, 1970 and 1971 Topps, and I am doing really well with my set building. 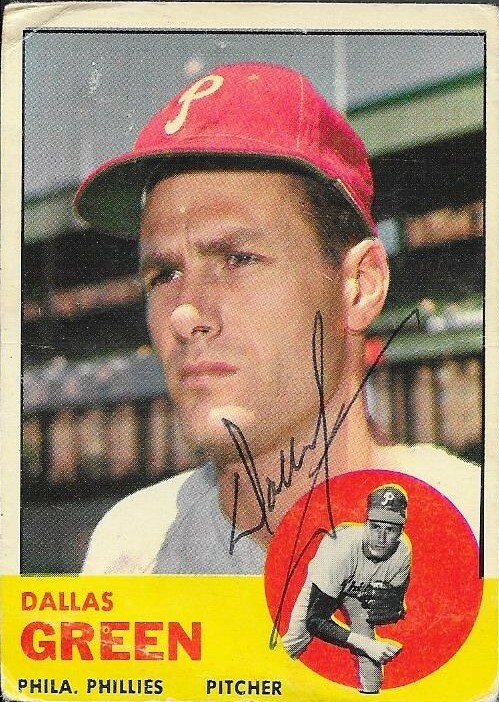 I also picked up a few 1969s in the Sportlots order, so keep an eye on the wishlist for an update soon. The best part of receiving birthday packages from the card community has been the originality and thought that fellow collectors have put into what they have sent. I oftentimes tell my friends that I would much rather receive a nicely written note instead of them spending their hard-earned money on me. I got a package from my little buddy, Nick, on Friday and loved what he sent along. I had cleaned him out of Orioles stuff long ago, so Nick scrambled to find some things that he gelt would suffice as a birthday gift, but he really could have just stopped at the above Topps custom card. The card features Nick from several years ago when he met Houston Astros ace, Dallas Keuchel. Nick signed the card and personalized it to me. For someone so young, you can tell that Nick has practiced his autograph for quite a while. The card is awesome. Nick actually is a very talented ballplayer. He messages me after each game that he plays, and they always seem to be wins. I hope to hear his name called in a couple years during the MLB Amateur Draft. 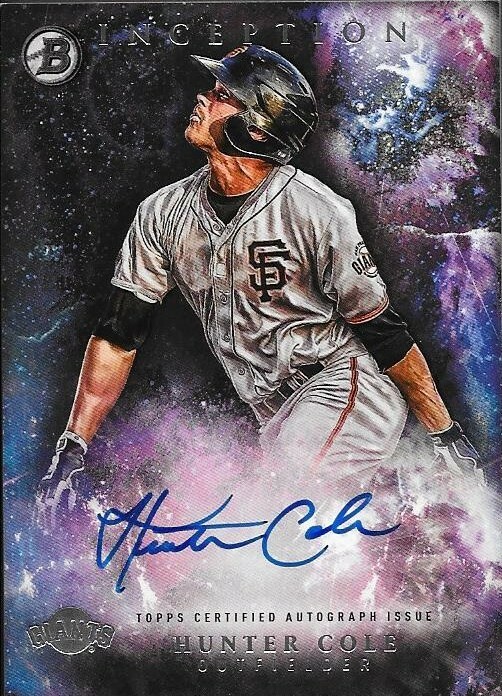 I'll already have a pretty sweet auto! Nick sent along some prospect cards that he had been holding onto recently. This Patrick Leonard from 2013 Bowman Platinum is a really nice card. It's not numbered, but the jumbo relic and auto are still nice. 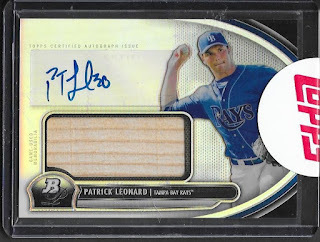 Bowman Inception is probably one of the most appealing to the eye of any product you will see. I watched my buddy Robert bust several cases of this at the National, and the cards just looked amazing. I was really happy that Nick sent this along, this card looks great. 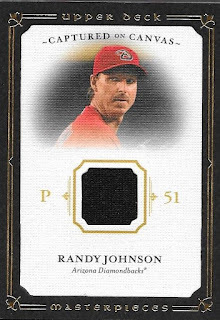 Not a prospect or an auto, this Masterpieces Randy Johnson relic is still a nice card. Masterpieces was always a great offering from the last days of Upper Deck. 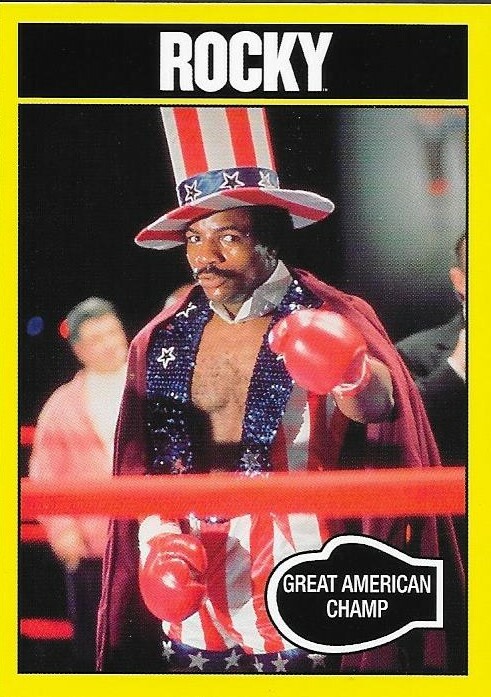 This is one of those products that I wish Panini or Topps would buy the rights of (can they do that?) and re-release into the market. Finally, here is a really good prospect auto from 2016 Chrome. 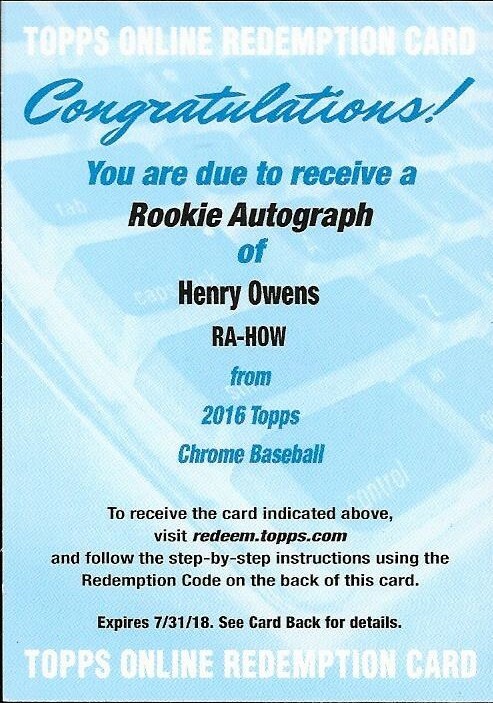 I'm not a Red Sox fan by any stretch of the imagination, but I recognize that Owens is a pretty good prospect. I know a lot of Red Sox fans who would want this, but since it was a gift from Nick, I won't let this leave my collection. I will likely redeem it soon. I met Nick through Instagram maybe two years ago and completed a couple trades with him. We talked off and on after our initial dealings, but really hit it off earlier this year. We pretty much talk every day. He has to be one of the funniest people I have ever met; not for sheer comedy alone, but the fact that when Nick has something on his mind, he is not afraid to speak it. Usually, that elicits some pretty candid responses from others in our Skype calls. Nick cracks me up. He is also amazing with my son, Chris. Nick is always reaching out to Chris and chatting with him. I think it is good for Chris. Maybe one day, he will work on giving more than one-word responses. Thank you so much for the birthday package, Nick! I really appreciate it! I got a couple birthday packages in the mail today, which helps extend my birthday for a few more days (not complaining about that!). One of the packages was from my good friend, Drew. Drew has been easing himself back into the blog world since he returned from an awesome study abroad program earlier this year. Unfortunately, the trip exhausted Drew and his funds, so he wasn't able to attend this year's National. Drew was sorely missed, especially since the National was relatively in his back yard. Drew surprised me by crossing a card off of my Top Ten Wishlist. 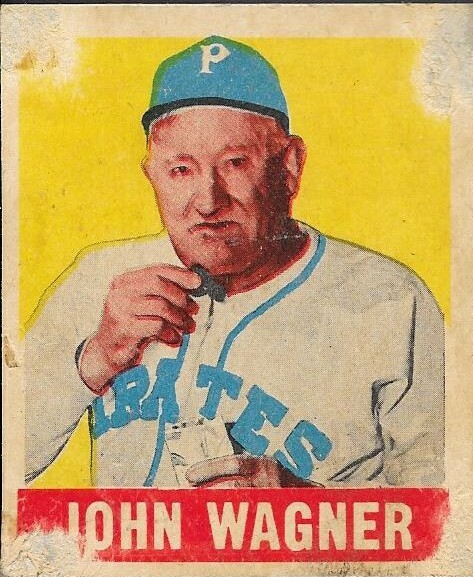 This 1948-49 Leaf "John" Wagner is a card that I have kept an eye on for a while. I almost picked one up at the National, but the guy wanted way too much for it. This one has awesome edges and corners, but some paper loss on the corners; likely due to someone having it taped into an album. The back of the card looks flawless, and is a nice read. 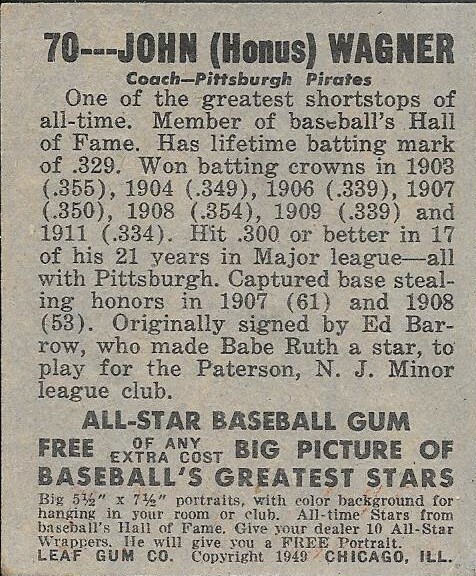 I especially like the ad for the All Star Baseball Gum Big Pictures "for hanging in your room or club". How many kids these days build club houses? This is an awesome card. 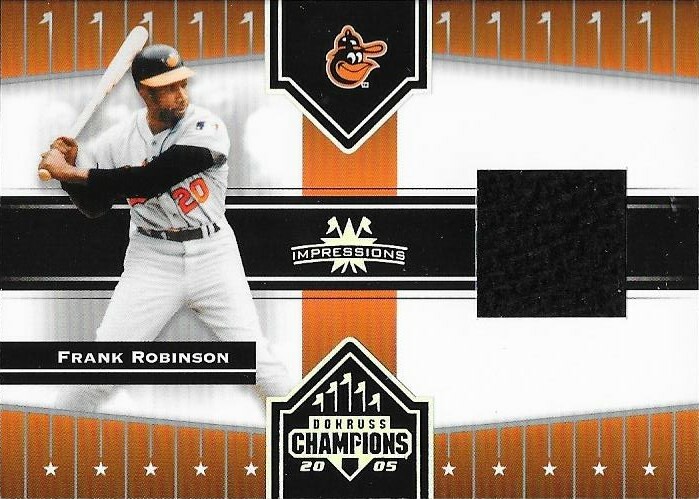 Drew also included this really cool Frank Robinson relic from 2005 Donruss Champions. This was a nice set that came out back when I had just gotten back into the hobby. 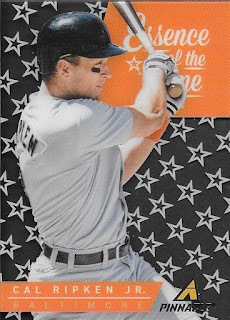 I always liked these cards, but didn't pull any hits. This Frank will look nice with my other Robinson cards (of which there are few, since Frank eludes me most of the time). Finally, we have this Adam Jones framed relic from 2016 Ginter. The framed relics seem to be tougher to find, since they now have the full card relics. I made a trade with Drew to pick this one up. Other than Mom or Andrew, Drew may be someone I have talked about the most on this blog. He and I have been trading since he first broke into the hobby. He was just about 12 at the time, I believe, and now he is almost done with college. We have been close friends for well over 7 years now, and have even taken a trip to the Hall of Fame (Chris still says he didn't break your dad's car door). Thank you so much for the awesome cards, and most of all, your friendship, Drew! I greatly appreciate it, and can't wait to see you at next year's National! Birthday Gifts From Mom - What's a Charleston Charlie? Mom woke me up last Saturday because I was sleeping in her guest bedroom and she and Dad were getting ready to head to a race. So, I was half-asleep when she presented me with a gift bag for my birthday. 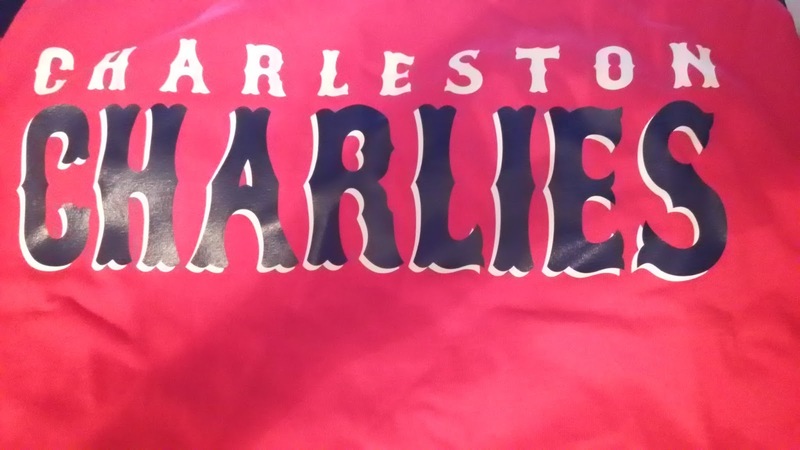 I don't recall where she told me she found this Charleston Charlies t-shirt, but it is pretty cool. Cool because my youngest brother's nickname is Charlie and our new cat's name is Charlie. Pretty cool. However, I don't have a clue who the Charleston Charlies were. 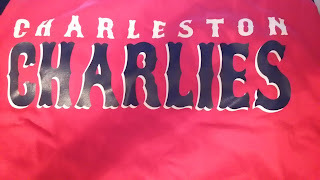 Because you can find out anything with a simple Google search, I learned that the Charleston Charlies were a Triple-A team located in Charleston West Virginia from 1971 to 1983. They were the former Charleston Jets, then relocated to Maine in 1984 to become the Maine Guides. They now are known as the Scranton-Wilkes Barre Railriders. The Charlies were affiliated with the Pirates from 1971 to 1976; Astros from 1977 to 1979; Rangers in 1980 and the Indians from 1981 to 1983. Dave Parker and Tony LaRussa are a couple of many former stars who were Charleston Charlies. Mom also picked up a Richmond Flying Squirrels shirt that looks really cool. If Richmond can hold onto the team, maybe I can wear it to a game. Mom also included this cool Cal Ripken acetate card from 2013 Panini Pinnacle in with my birthday card that came in the mail a couple days before my birthday. The card isn't numbered, but looks really cool. I'm glad to add it to my Cal PC. I could write a whole series of blog posts about how awesome my mom is. While I'm certain that she would just Love for me to do that, I will just advise that one can simply click on the "mom" tag at the bottom of this post and let all of my past blogs do the talking for me. I will say that Mom always helped support my hobbies, ever since I was leaving coins lying on the floor at 8 years old. She always showed an interest in what all of us were doing, and many times, collected alongside us. She still buys packs of cards here and there. Someone should tell her, though, that they have not printed any cards showing shirtless David Lough. Thanks for the birthday presents, Momma! I love them, and I love you! My friend, Michael, sent me a really nice birthday gift that had several autographs included. 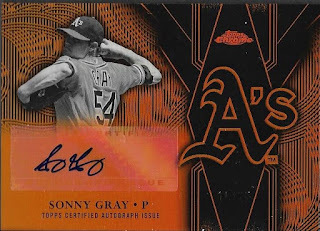 He contributed to my Sonny Gray side-PC with this really nice Topps Chrome auto. This is the Team Logo autograph and is numbered 1/25. I haven't added too much to the Gray PC this year, but I probably ought to. With the terrible season that he has had this year, the values on his cards and autos has gone down tremendously. 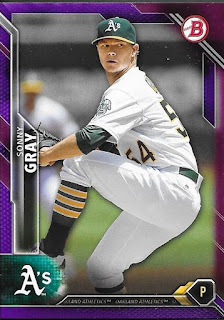 I got a few Gray cards at the National (that I will show soon) for really cheap prices. Another guy who's stock has fallen is Orioles #1 draft pick, Hunter Harvey. Harvey has frequented the DL more often than not in his brief professional career. He has a long road ahead after having Tommy John surgery earlier this season. This is an IP auto on a 2015 Bowman that Michael sent along. Michael also included two Jimmy Nelson autos and a bunch of refractors from 2016 Chrome. I have known Michael for almost 5 years now, and have spent a lot of time with him at Orioles Fan Fest and some Orioles games. When I went to Baltimore in July, I was able to have dinner with him, and ride around the city (once going the wrong way down a one-way street. Oops.). Michael is a great guy and I am glad we are good friends. He is off to college now, working toward a career that I am certain that he will excel in. He is one driven kid. Thank you so much for the gift, Michael! I got my first birthday present of the year at the National while I was hanging out with my good friend, Andrew. He surprised me while we were hanging around a table with this awesome 2014 Topps Five Star Cal Ripken relic/auto. The booklet is numbered 12/50. I know Andrew probably paid a lot for it, but I don't want to know what he spent. 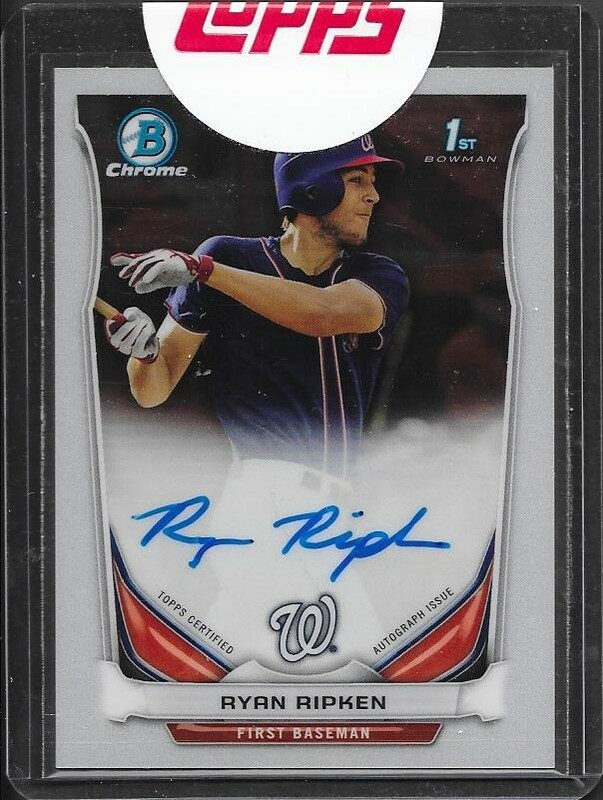 It doesn't matter, I'd be happy with a nice letter, really, but this card is an awesome addition to my Ripken PC. I don't know what I can say about Andrew that I haven't said on this blog before, but he is a great friend. I've known him for over 5 years now, and have enjoyed every minute of it. I'm really lucky to be able to call him my friend. Thank you so much for the awesome birthday gift, Andrew. 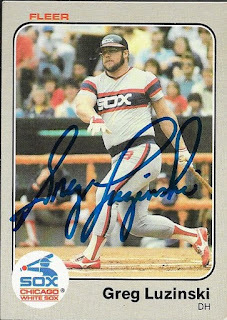 One of the last free signers that I was able to get at the National was Greg Luzinski. I don't really remember his signing, I just remember standing in line forever. I thought this 1983 Fleer would look cool signed, and I was right. I wasn't able to use a Wild Card on him, which was disappointing, since I had a ton of his cards that I could have gotten signed. By the time I was done with his signing, I was over trying to get anyone else. The VIP signer experience at the National was rough, and I don't think I will work as hard when I go next year. Luzinski (b. 1950) played in the majors from 1970 to 1984 for the Phillies and White Sox. He had 1795 hits, 307 home runs and a .276 batting average. He was a 4-time All Star and finished twice in the NL MVP voting (1975 and 1977). He won the World Series with the Phillies in 1980. Luzinski appeared on the Hall of Fame ballot in 1990 and received 0.2% of the vote. 1994 Topps From PA and Mark M.
I got two care packages in recently that almost wiped out what I needed from my 1994 Topps set needs. My friend, P. A., and blog reader Mark M., both attacked my needs list at the same time and sent me care packages. I really appreciated both Mark and P. A. thinking of me. I plan on hitting up Sportlots soon to wipe out what is left on the needs list, and also finish up some other outlying sets. I also have a box of 1995 Topps that needs to be sorted so I can finally get to work on that set. That project is going to happen very soon, I promise. I really want to get these 90s sets done so I can fully focus on finishing 1969, and making a dent in 1967. Thanks Mark and P. A. for taking a look at the needs lists and going out of your way to help me out. It definitely doesn't go unnoticed, even though it might take me a while to get around to posting. One of the free signers that I was able to get at the National was former Yankee, Ron Blomberg. 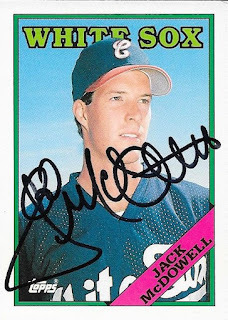 I was able to get one card signed by him, so I chose this 1988 Topps Turn Back The Clock, since I didn't have any of those cards signed yet. It turned out really nice, I think. 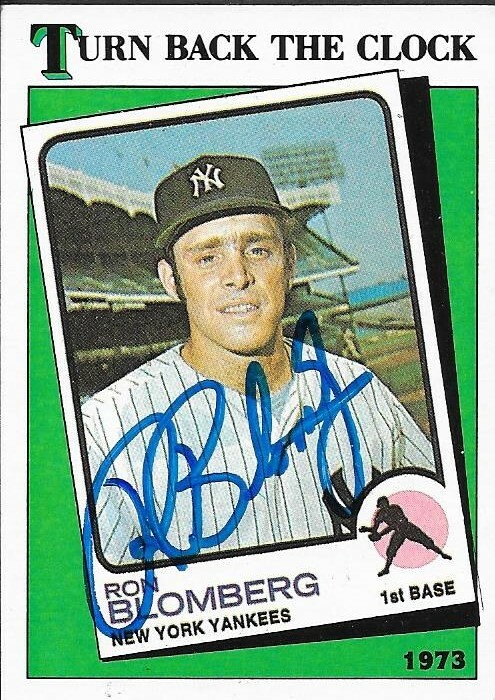 Blomberg (b. 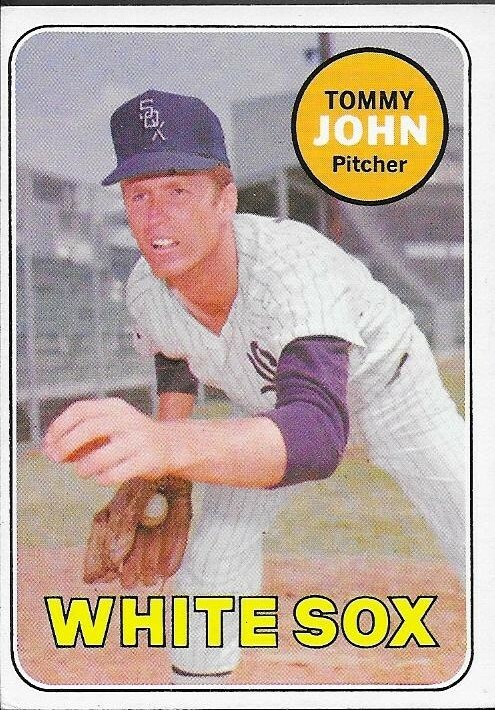 1948) played in the Majors from 1969, 1971 to 1976 and 1978 for the Yankees and White Sox. He had 391 hits, 52 home runs and a .293 batting average. He is best known as the first designated hitter in baseball history. One of the cool things about the bargain boxes at The National is that you can find some really nice stuff when you really aren't looking for it. I had no Nick Markakis cards in my mind to check for while there, but I found this really cool patch card numbered 8/10. It's a 2-color patch from 2013 Panini America's Pastime. I haven't added anything significant to the Markakis PC since he signed with the Braves before last season. This card is a really cool one, even though the patch almost goes unnoticed. I got the card for less than $8 as part of a bulk deal, so I likely got it for closer to $5. Not too bad for a patch of that size and that low of a serial number. One of the VIP signers at the National this year was former MLB player, Von Hayes. His line was one of the easier ones for me to get in, and I actually was able to use a Wild Card on him. 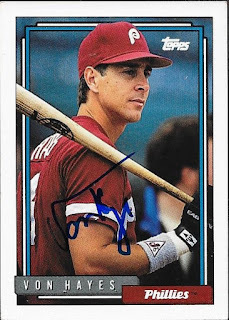 I was really happy to get this 1992 Topps Stadium Club card signed by him in blue Sharpie. I thought the card turned out really nice. 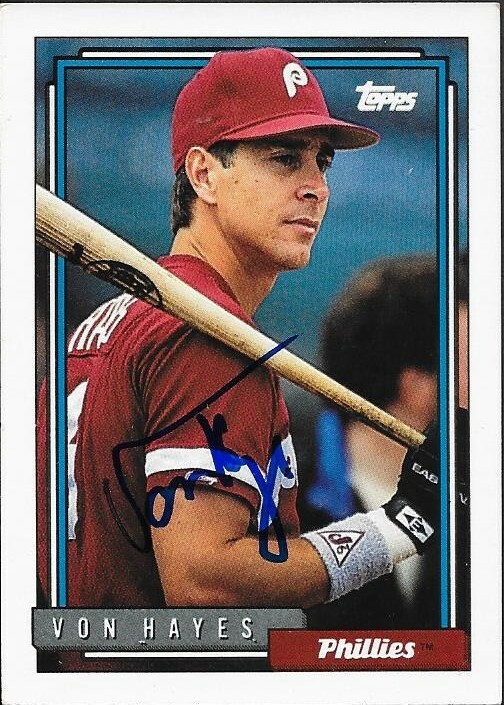 I was also able to get this 1992 Topps signed, which will look nice as part of my Topps Autograph Project. 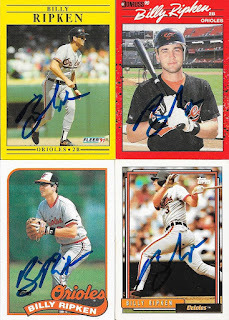 I only have 4 cards out of the 1992 set signed, so there won't be a lot to choose from like other years. Hayes (b. 1958) played in the Majors from 1981 to 1992 for the Indians, Phillies and Angels. He had 1,402 hits, 143 home runs and a career average of .267. He finished 8th in the NL MVP voting in 1986 when he led the league in runs scored (107) and doubles (46) with a .305 average. He was also an All Star in 1989. 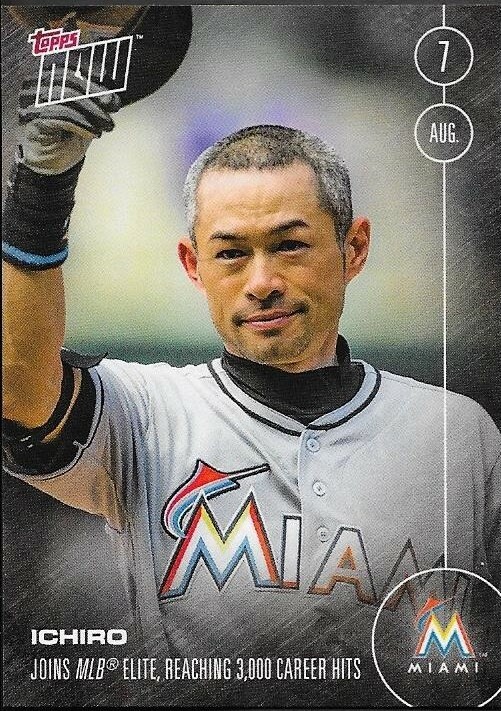 I imagine that when the idea for Topps Now was being proposed, moments such as Ichiro's 3,000th hit were big selling points on the idea. Well, Ichiro picked up the historic hit on August 7 and I made sure to partake in the 5-pack of the Topps Now card. I sent one of them off to my good friend, Ryu; I'll keep one for myself, and I gave my wife one, since she loves Ichiro. The others, I will probably sell at some point at a show. As of tonight, Ichiro stands at 3,018 hits, 27th All Time. The Topps Now card is really nice, and I am glad I decided to pick it up. I picked this card up on the first full day of the National from a vendor who had a whole bunch of Orioles stuff. 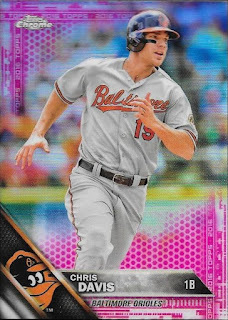 I was hoping they would have the Chris Davis laser booklet insert from 2016 Topps, but they didn't. I saw this Brooks, though, and paid their high price for it. 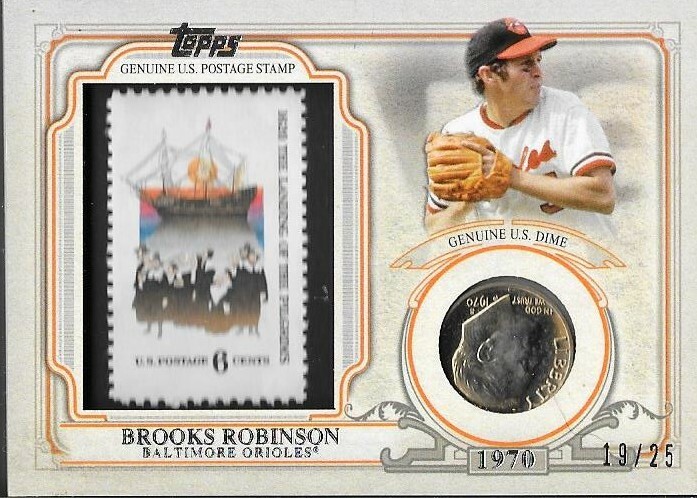 The card was $40, but I really like these coin/stamp cards, so I was ok with it. The fact that it was Brooks, well, that made it even better! 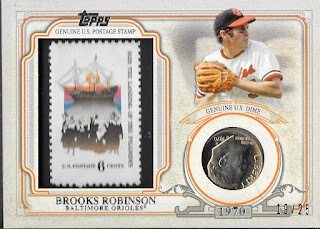 I want to go back and get the birth year coin/stamp Brooks card sometime. I have the Ted Williams, and it is one of my favorite cards. This came from 2016 Topps Series 2. I opened 3 jumbo boxes of series 2, and didn't pull any of these. Someone on Instagram told me that the $40 I spent wasn't too bad of a price, so that made me feel better. One of the first signers that I was able to get at the National was Mitch Williams during the VIP party on the Wednesday of the show. They were supposed to have Steve Garvey there as well, but he backed out at the last minute and was replaced by Roy White and someone else (I can't remember who). I got White on a baseball for my good friend, Drew, but since I didn't have any cards of the other guy, I didn't bother. 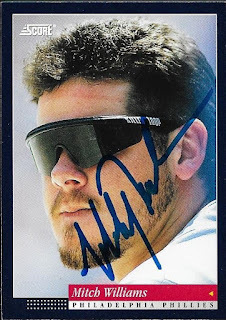 I did have a bunch of cards of Mitch Williams and ended up getting three signed. Two of them went to my friend, Max, and I kept the above 1994 Score. Williams (b. 1964) played in the majors from 1989 to 1995 and 1997 for the Rangers, Cubs, Phillies, Astros, Angels and Royals. He had a career record of 45-58 with an ERA of 3.65 and 192 saves. He was an All Star in 1989 while with the Cubs and finished as high as 6th in the NL Cy Young voting in 1991. I got this 1994 Score out of one of the boxes of cards that Mom picked up for me. One of them (a 5,000-count box) is almost all 1994 Score. This was a really nice set back then, but was prone to sticking together if the cards got hot. Luckily, the cards were well taken care of, and I have been able to use some for graphing. They look really nice with blue sharpie. One of the coolest deals that I got at the National was this signed baseball of Bill "Spaceman" Lee for $5.00, The ball is a Joe DiMaggio commemorative OAL baseball. The vendor had cases and cases of them for $10.00 but gave me a deal for $5.00, I figure the ball itself is worth a lot more than that. Lee (b. 1946) played in the majors from 1969 to 1982 for the Red Sox and Expos. He had a career record of 119-90 with a 3.62 ERA and 713 strike outs. He was an All Star in 1973 and finished 23rd in the AL MVP voting. Lee appeared on the 1988 Hall of Fame ballot and received 0.7% of the vote. He is most widely known for his eccentric personality, which led to his nickname "Spaceman". 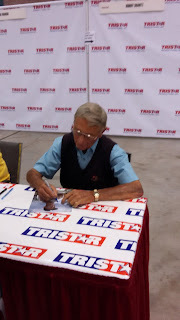 We met free signer Bobby Shantz during the Wednesday Sneak Peek at the National. Unfortunately, the wait in line was excruciating and it set the tone for most of the other VIP free signers for the rest of the show. Shantz, himself, was really nice, and did take the time to chat with everyone. I was afraid I would miss out on him, so I waited in line for over 2 hours to get him. By the time I got up to him, Andrew had given up and gave me his ticket. I used both name tickets for my and Andrew's cards. They both turned out great. 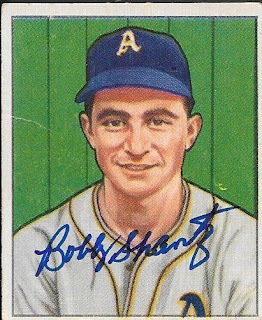 Andrew and I both got 1950 Bowman Shantz cards signed. This is Shantz's rookie card. During my chat with Shantz, he noted that this card was an old one. I asked him if he kept any of his cards and he said no, but fans sent him cards all of the time. He said that he rarely sees this one, though. He seemed happy to see and sign it. The card turned out great. I am happy to have met Shantz. He was a really nice, friendly guy. I'm also glad I was able to help Andrew out and get his card signed as well. Too bad the line was ridiculous. I might have to approach the free signers differently next year, because those lines killed my legs and feet this year. At the time I picked this card up at the National, I was excited. I saw it in a vendor's showcase and immediately paid his price of $20 for this card and went about my business. Unfortunately, for me, I probably should have looked a little bit longer while I was there, because on the last day of the show, I saw two of these in a bargain box for $4 a piece. Dang. I'm sure that the vendor I got this from saw my Orioles gear and figured he had a sucker. Oh well. $20 isn't a bad price to pay when you consider that my goal has been to get Ryan Ripken's autograph so that I can say that I have three generations of Ripken autos (and Bill, as well). I really want Ryan on a baseball, but at this point, this card works for me. I have Cal, Sr. and Cal, Jr. on baseballs. I don't have Bill on one, either, but that shouldn't take me much longer. Ryan is still in the Nationals system, after being drafted in the 15th round of the 2014 draft out of a Junior College in Florida. He is scuffling so far in his MiLB career, with a .203 batting average, 3 homers and 47 RBI over 141 minor league games across 3 seasons in Rookie League, Low A and A ball. I doubt he will pan out much more than having a famous last name, but at 23, he is still fairly young. 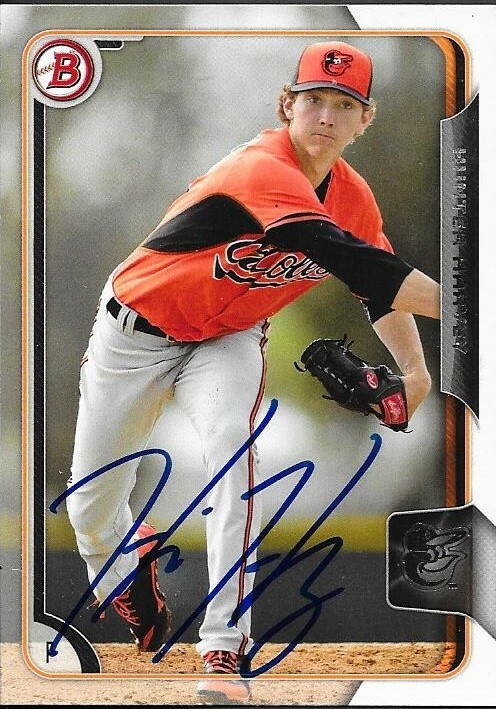 I was initally disappointed that he wasn't drafted by the O's (he was drafted by them in 2012 out of high school, but didn't sign), but he probably stands a better chance in DC and not living up to his dad's shadow in Baltimore. So, I kind of wish I had waited to pick this card up out of the bargain bin, but $20 is still not bad, especially in the grand scheme of things.